I was born and grew up in Larissa, Greece. I began with photography in the end of 80s, with B/W and darkroom. The interest became a passion and studies at the Department of Photography, at the Technological Educational Institute (T.E.I.) in Athens. 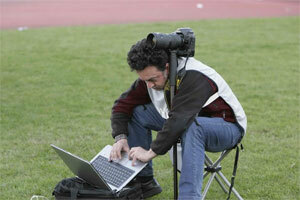 After finishing my photography studies, in 1996, I was occupied with social documentary and sports. My first solo exhibition took place in March 1998, at the Chatzigiannio Cultural Center, in Larissa, with pictures from a train and snapshots from the Open Air Market (B/W). My second solo exhibition "Carnival Moments" with photographs that were shot in Tyrnavos, from 1997 till 2009, at the local carnival and Bourani (phallic festival of fecundity), took place in February 2010 at the Tyrnavos municipality hall. I participated in the initial group exhibitions of the Larissa Photography Club, in a group exhibition in the festival "Speech and Arts Lefkas", in 1995, in the group exhibition "A Journey", in a train wagon while traveling (route Athens-Thessaloniki), in 1996 and in 2008 in an exhibition with theme "Argentinean tango", in Thessaloniki. I work in a daily newspaper in Larissa, as a photojournalist, I am a member of the "Greek Press Photographers Union", I taught in several classes of NELE, IEK, KEK, KEE. I curated and illustrated literary books. Photographs taken by me are in the school books for lesson "Greek Language" of the 1st and 2nd class of the high-school. I took part in the anti-global movement, photographing in Nice, France, Prague-2000, Genoa-2001, Thessaloniki-2003 etc and made travel photography in Cuba-2004, Venezuela-2005.